Rochester Castle has been shut to the public after reports of “a major stone fall inside the keep”, requiring emergency repairs. A notice on the English Heritage website says: “Due to unforeseen circumstances, Rochester Castle is closed until further notice. We’re very sorry for any inconvenience caused.” No reason for the closure is given. It is understood that engineers are now assessing the extent of the damage. 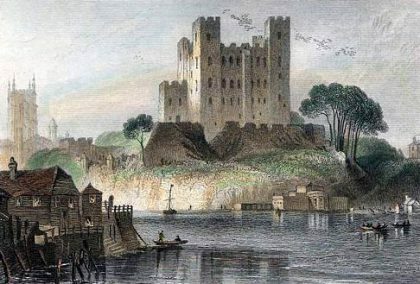 The first castle at Rochester was founded soon after the Norman Conquest and was given to Bishop Odo, by his half-brother, William the Conqueror. In 1215, during the First Barons’ War, the castle was held by rebels against King John. In October, the king besieged it, making his base in Boley Hill. His five siege engines hurled a barrage of stones at the castle’s wall but were largely ineffective, and so his soldiers set about undermining the southeast corner. The king then sent “with all speed by day and night 40 of the fattest pigs of the sort least good for eating to bring fire beneath the tower”. They were placed in the tunnel and the wooden props set alight. The intense heat caused the mine to collapse, and the tower came down. The garrison fled to the other half of the castle and held out until 20 November. The castle was repaired 10 years later and the fallen corner replaced with a round tower. Eventually, the care of the castle was entrusted to Rochester City Council and during the early 1960s a number of buildings were removed from the moat, including the attractive Quaker Houses. The Ministry of Public Building and Works took over its care in 1965 and guardianship transferred to English Heritage in 1984, although Medway Council is now responsible for daily management of the castle.